Use the construction below to investigate the incenter of a triangle and answer the questions below. 1. Are the 3 angle bisectors of a triangle always concurrent? 2. What is special about the incenter and the edges of triangle ABC? 3. What is the location of the incenter compared to the triangle, when the triangle is acute? 4. 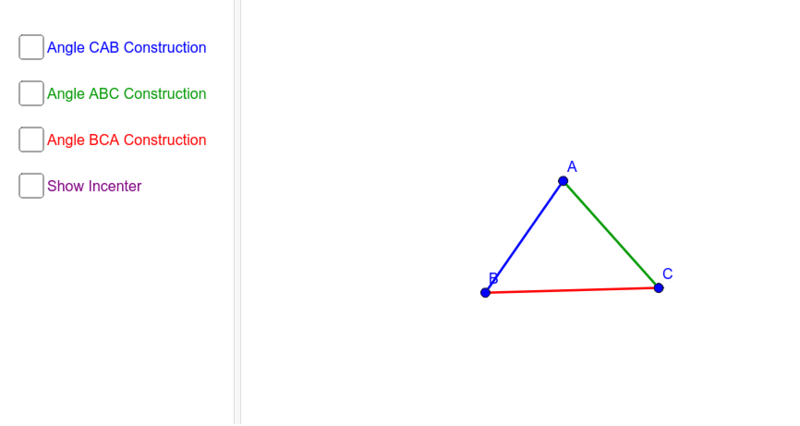 What is the location of the incenter compared to the triangle, when the triangle is obtuse? 5. What is the location of the incenter compared to the triangle, when the triangle is right?